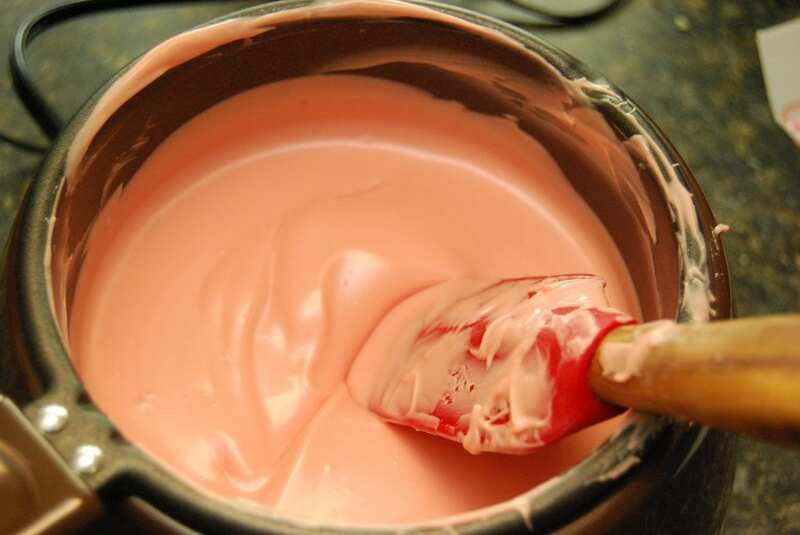 So many of you know about my love affair with Wilton. I have gotten a kick out of learning how to decorate cakes, cookies and cupcakes over the past year. I am not that great at it, but I love doing it. When I heard that Wilton was launching their newest book, Pops! 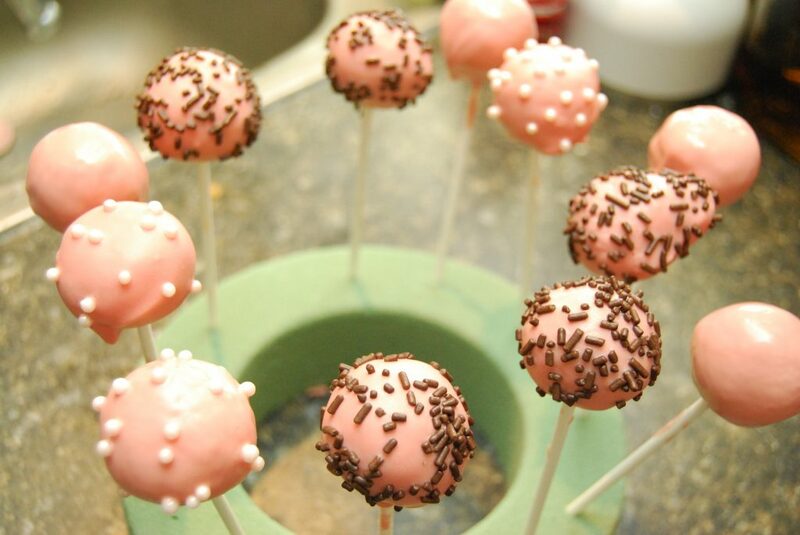 Sweets on a Stick. I was very excited to try these Cake Pops out. Now I am not a professional decorator, nor am I that experienced with it so please don’t laugh at my creations, but I had a lot of fun with it and I think that my next few batches will turn out a lot better. I learned a few tricks along the way, and I hope to share them with you. 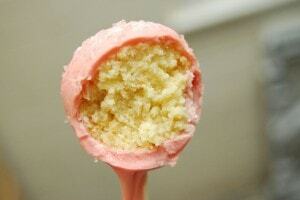 So… some of you are probably wondering what a Cake Pop is. 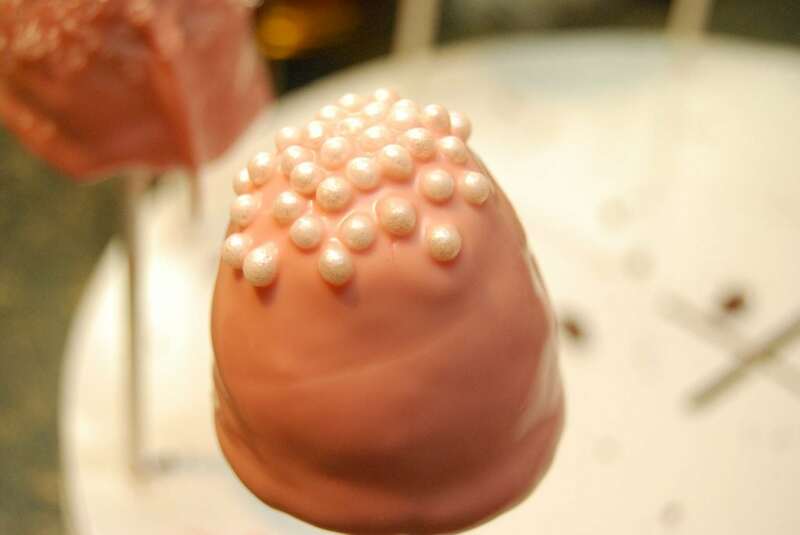 A cake pop is a mixture of cake and icing rolled up into a shape (usually a ball) and dipped in melted chocolate and decorated. It comes on a stick for easy eating! 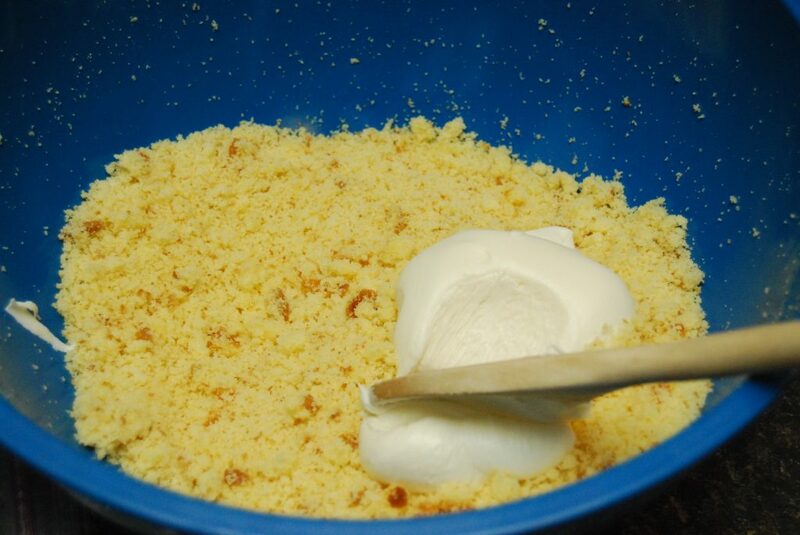 I baked a 9×13 cake and crumbled half of it into a large bowl (I froze the other half). I then added about a 1/2 cup of icing and combined it. I than formed the mixture into small balls and stuck them into the freezer for about 15 minutes (or you can refrigerate for about 2 hours). 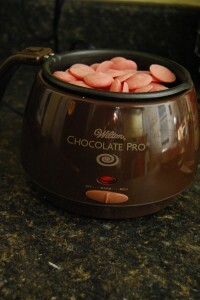 While the pops were in the freezer, I melted the chocolate using the Wilton Chocolate Pro Electric Chocolate Melter. If you are planing on making these yummy treats, I highly recommend this product. 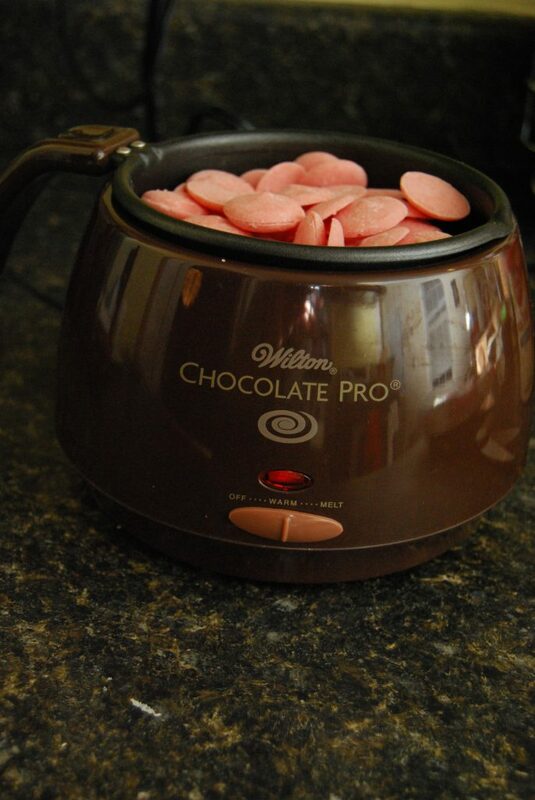 You let it warm up for about 5 minutes and then pour your chocolate melts into it and it melts it perfectly. 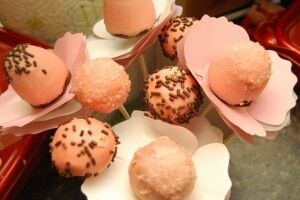 This first time I used the Pink Chocolate melts and had a great experience with them. In my second attempt I used the blue melts and it was a little goopy. I thinned out the melts with a little veggie oil and that helped. It might be because I added some extra blue dye to make it really blue. I think next time I will stick with the white melts and color them with my food color gel. The chocolate melts melted beautifully. During this process, I decided that I was also going to try out the Brownie Silicone Pop Mold that came with my kit. 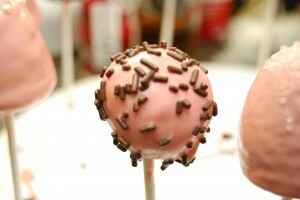 This is a really simple way to make brownie pops. You simply follow the directions on your favorite brownie mix and fill the molds about 2/3 of the way and bake them. They fall right out of the molds (don’t forget the cooking spray) and are ready to cover in chocolate. I loved having a mixture of cake pops and brownie pops for my bouquet. Back to the Cake Pops… next I took the cake balls out of the freezer and dipped a stick into the chocolate and stuck them about half way into the cake balls. I returned the balls to the freezer while I got my decorations ready. I used cupcake liners to put my decorations in. This saved a lot of time and made the decorating phase a lot easier. For these particular pops I wanted them to look feminine and sweet because I was bringing them to my hubby’s grandmother’s 90th birthday party. 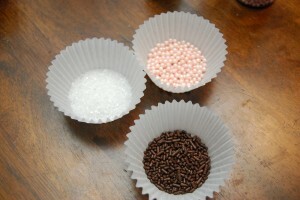 I bought Wilton’s pearlized pink balls, decorating sugar, and the brown sprinkles that also came in my kit. Next, I took the balls back out of the freezer and starting dipping. I would dip on into the melted pink chocolate and then sprinkle one of the decorations over it. I then put them on a Styrofoam block to dry. (Wilton does have a stand that you can purchase that will also hold the pops while they dry, but I didn’t read the directions correctly and it didn’t work out well for me). Those cute flower wrappers also came with the kit. 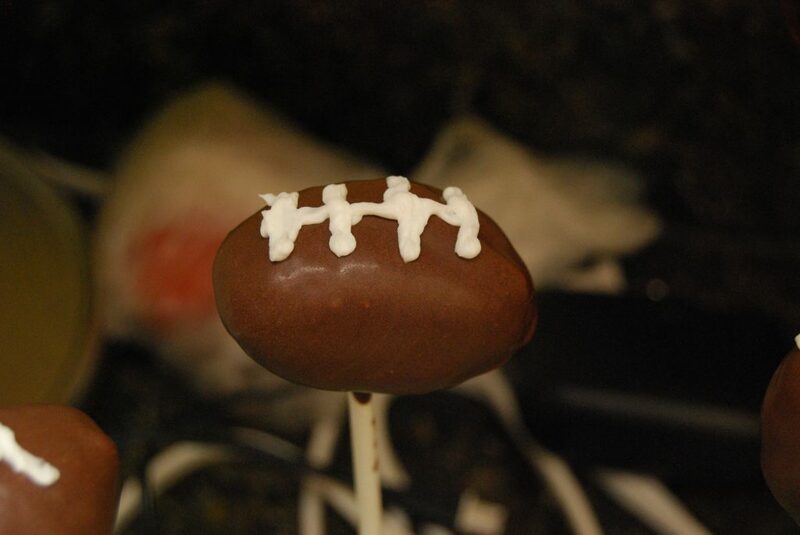 They made the brownie pops look so elegant. Not bad for my first time. My next mistake is that I didn’t leave myself enough time to decorate these little guys. My horseshoes fell apart when I tried to dip them. Next time I will just pour the chocolate over them. The first photo is supposed to be a horse shape. 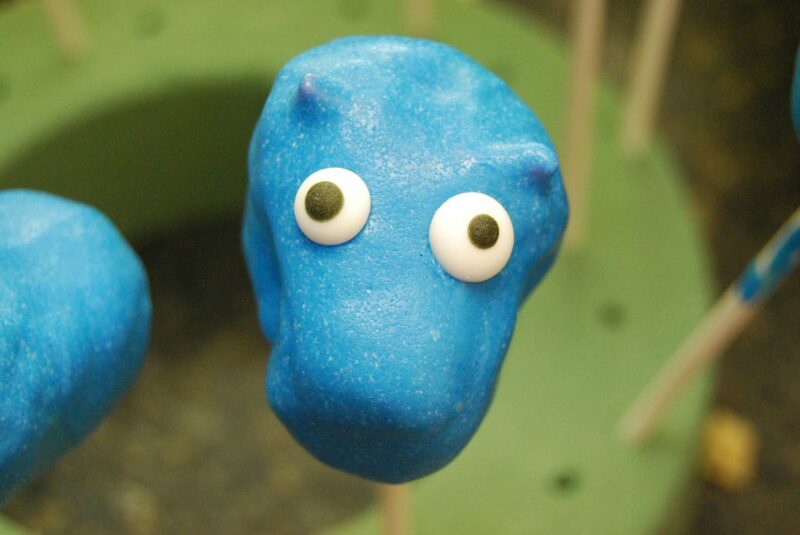 I stuck some of the decorations into the cake pop to make ears and then I dipped them. I added the eyes (also from Wilton) and thought that they looked kinda cute. I wish I had some blue cotton candy to make the mane, I think they would have turned out better. 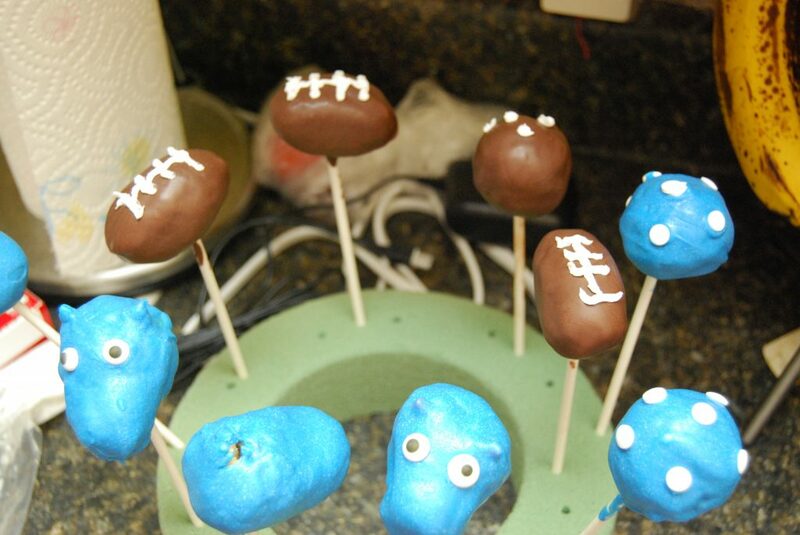 I also made little footballs for the occasion. My son took one look at them and said “football” so that was all I needed to convince me that they actually did look a little like footballs. So while attempt number two didn’t turn out exactly as I had planned, I learned a lot about the whole decorating process. Unfortunately the Colts lost last night, but that does mean I have a whole 8 months to perfect them before our Colts Kickoff Party in September! I hope you check out Wilton’s website and the new Pops! 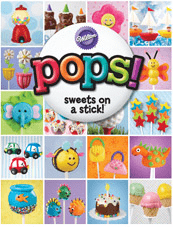 Sweets on a Stick book for yourself. These are so child friendly and adult friendly sweets that are a lot of fun to make. 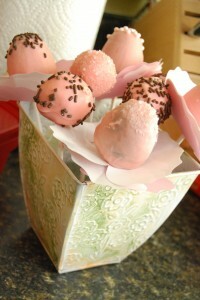 They would be a perfect party activity for children as well (and you know they would love to eat anything they make). I will update everyone on my adventure to create adorable Cake Pops throughout the year. I would like to thank Wilton who provide me with a Bloggers Cake Pops Kit in order to create this post and enter the “Pops in a Post” Contest. The contest gives me a chance to win $500 or $100 prize from Wilton. Wow, I adoreeeee the pink/brown/white combination. The cake inside looks delicious too, great work! 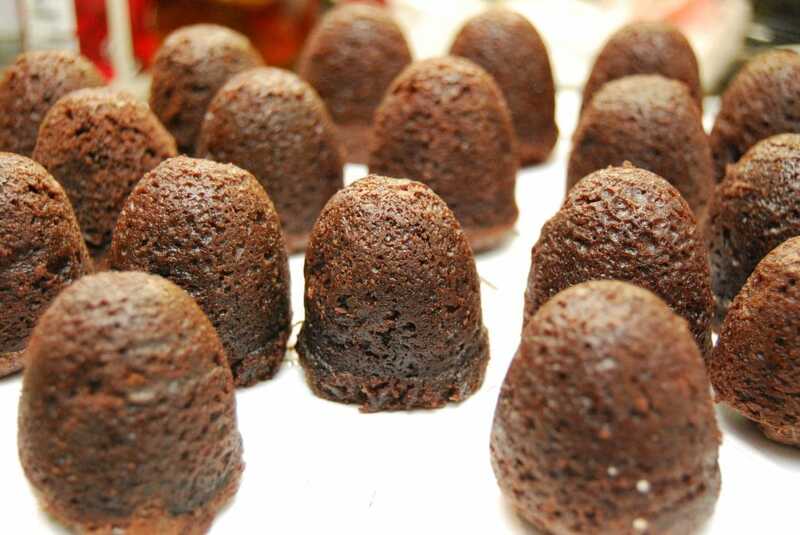 Can you make these with brownie mix? I haven’t tried, but I am thinking if you make the browie mix more cake like (add an extra egg) that you could do it! Very purdy, I think they turned out great! Thanks Kim! I thought your caterpillar was adorable! I love your pops!! The brownie pops are so good right?!?! They taste fantastic. I love to mix and match them, because believe it or not, not everyone loves yellow cake. Great job! I love the pink ones! They look awesome to me. I know for sure I could never make anything that looked close to what you made. Sorry about the Colts but I am a HUGE Titans fan so I am not sorry to see that they are out of the playoffs! Your a Titans fan? I guess nobodys perfect! You did a great job! Love the pink ones and the footballs! So cute! These are super cute! Great job!! I must try these for my grandkidlets! You’re so talented!! The pink ones are gorgeous!